Houghton Library invites you to take part in this masterclass with Harvard's world-renowned teachers and scholars by choosing your own track through this exhibition. We hope they inspire you to have your own encounters with the collections in the reading room, seminar rooms and online. Houghton75 is a new podcast series that presents different voices and perspectives on Houghton Library in its seventy-fifth year. 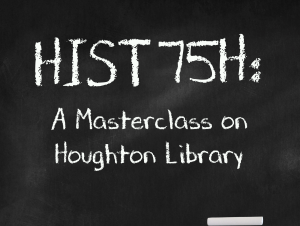 The series kicks off with over a dozen Harvard faculty members sharing their thoughts on the collection item they chose for the exhibition HIST 75H: A Masterclass on Houghton Library. The chosen item acts as a springboard for a broader conversation about their research and teaching at Houghton-based research and teaching. The interviews cover topics as varied as Theodore Roosevelt as a symbol of masculinity and the history of race in American music, and will be released throughout 2017.